This paper offers a RADICAL new concept in regard to one of the primary causes of aging. Deuterium is an isotope of Hydrogen. An isotope is any of two or more forms of an element having the same atomic number but with different weights (mass). Hydrogen has 2 isotopes, Deuterium (stable, i.e. non-radioactive) and Tritium (radioactive). Normal tap water consists of two parts Hydrogen to one part of Oxygen (H20) while Heavy water consists of two parts of deuterium to one part oxygen. Hydrogen consists of 1 electron orbiting 1 proton. Deuterium consists of 1 proton combined with 1 neutron orbited by 1 electron. Thus, TO CONVERT DEUTERIUM TO HYDROGEN, WE MUST REMOVE THE SINGLE NEUTRON. Deuterium (2H) is twice as heavy as Hydrogen (1H). When Deuterium is combined with Oxygen we get Heavy Water. Heavy Hydrogen (Deuterium) can be detected by burning it, collecting the water formed and measuring its physical characteristics. Ordinary water differs from Heavy water in several ways. While water freezes at 0 degrees centigrade, boils at 100 degrees and has a specific gravity of 1.00, heavy water freezes at anywhere from 3 up to 82 degrees and boils at 101 up to 142 degrees with a specific gravity of 1.1074. Isotopes can be either stable or unstable (radioactive). Deuterium is a stable isotope and has a relatively permanent lifespan. Isotopic elements DO NOT DIFFER in their CHEMICAL PROPERTIES but ARE DETECTABLE by differences in their PHYSICAL PROPERTIES. Deuterium atoms are rare, sources differ in the NATURAL ABUNDANCE of Deuterium, ranging from 1 part in 4000 to 1 part in 7000. (1:4000 or 1:7000). For that reason, we will use 1:6000 as a standard. This means that OF ALL THE FLUIDS YOU DRINK OR COME IN CONTACT WITH, 1 drop in every 6000 drops will be a drop of heavy water. A drink of D20 will taste almost exactly like H20. However, seeds WILL NOT SPROUT in heavy water. When rats are watered with exclusively heavy water, they DIE OF THIRST although GLUTTED WITH WATER. Appreciable concentrations of heavy water mixed in ordinary water have been found to be extremely harmful to living organisms. Heavy water causes the metabolism to operate at ABNORMAL RATES. Just what does Heavy water do to living organisms to cause such deadly reactions? To answer that, we must delve into nuclear physics and find out just what it is about heavy water that makes it so useful to the atomic power industry. Since Deuterium is related to Hydrogen, we must find a way to visualize the relationship. Based on the work of Dinshah, Keely and Russell, we can think of Hydrogen as a color, like RED. When subjected to transmutation (filtering by a prism) we can see various other colors within the band of RED. These colors equate to the various isotopes. By heterodyning, we can alter the compound frequencies representative of mass to either higher or lower wavelengths. Thus, we will change the fundamental frequency of a mass to alter its physical properties. In nuclear reactions, neutrons are the bullets used to cause these reactions. When these fast-moving bullets are shot into a mass, they become subject to elastic scattering, similar to the energy absorption of billiard balls when struck by a single fast-moving ball. Ignoring the energy equivalence of the mass, the energy of a neutron is ENTIRELY KINETIC IN NATURE. As a result, in a mass of low atomic weight (or mass number), fewer collisons are required to slow down a neutron over a given energy range than in a mass of higher atomic weight (or mass number). The speed of a neutron is therefore reduced by each collision with nuclei until the neutron ends up with the same kinetic energy as the mass or medium. The reduction of energy in the neutron as brought on by such collisions reduces it to a fraction of an electron volt at ordinary temperatures. This new energy level is termed the thermal energy, since it depends on temperature. Neutrons reduced by such means are called thermal neutrons. When fast neutrons are SLOWED DOWN by such elastic scattering, the process is called THERMALIZATION. The nature of the substance used for this moderation is called a MODERATOR. A good moderator will reduce the neutron speed in a relatively small number of elastic collisions, but will not absorb the neutrons to any great extend. HEAVY WATER and CARBON are the BEST MODERATORS. A 1 Million Electron Volt (MeV) neutron must make about 18 collisions with HYDROGEN nuclei to REDUCE ITS ENERGY LEVEL to thermal values. The same neutron must make 114 collisions with CARBON TO ACHIEVE THE SAME ENERGY DECREASE. And what is the body based on, you got it, CARBON. So from this, we can see that CARBON plays a major role in the thermalization (reduction of overall energy) of the body. Did you know that the body begins to die somewhere in the range of 18 to 22 years of age? Did you also notice that the physique is fairly well established at that age? It can be said that you grow UP to 20 and OUT from then on. The OUT is an accumulation of tissue and thickening of structure as a DIRECT RESULT of the aging process. Let’s continue with the nuclear information and see if we get anything else of use. Fission is initiated by neutrons and is accompanied by the emission of neutrons. As a result, it is possible for the process, like a fire, to be self-sustaining, for energy to be generated (released) continuously, AS LONG AS THE FUEL IS AVAILABLE. Spontaneous Fission is exhibited by many nuclides with mass numbers of 230 or more. The spontaneous fission half-life generally increases with the mass number. Here we find an interesting correlation with Spontaneous Human Combustion. Since the body has large quantities of carbon and fat, once ignited by a hot enough flame, the body would burn quite freely and rapidly. The ignition can be precipitated by a number of factors. In this case, the running wild of the process of biological transmutation or the triggering of a spontaneous fissioning process. In order to maintain a chain reaction, it is not necessary that every neutron produced in a fission should be able to initiate another fission. The absolute minimum condition requires that for each nucleus undergoing fission there must be at least one neutron which causes fission of another nucleus. The reproduction factor or multiplication factor of the system is defined as the ratio of the number of neutrons produced by fission in any one generation to the number in the immediately PRECEDING generation. IF we use K to represent the multiplication factor, we can say that if K is LESS THAN UNITY, then a chain reaction is impossible since the system is SELF-QUENCHING. In the nuclear processes, this is termed SUB-CRITICAL and is equivalent to aging (and eventual death) as occurs beyond the age of about 20. We can visualize this as PUTREFACTION. If K is EQUAL TO UNITY, then the mass will become SELF-SUSTAINING, neither GROWING nor DYING. This level is referred to as CRITICAL MASS and is directly analogous to the approximate age of 20 IN HUMAN TERMS. This is when the body is MOST STABLE and PHYSICALLY PERFECTED, not to mention when the maximum carbon level (based on physical size) has been achieved. It is at that time ruled by the mass accumulation of CARBON ACTING AS A MODERATOR of the biological transmutative processes to SUSTAIN THE OPTIMUM CONTROL of the fissioning process. This is what Keely referred to as a perfectly differentiated system and has some bearing on the superconducting state. This is also relevant to Prigogines findings in regard to dissipative structures. If K is GREATER THAN UNITY, say K = 1.05, and we started with 100 neutrons, we would produce 100 X 1.05, i.e. 105 at the beginning of the SECOND genertion; that is, the number of neutrons would increase from one generation to the next. After 100 generations, the number of neutrons present would be 14,800. As we can see, a few neutrons COULD INITIATE AN EVERY GROWING CHAIN OF FISSIONS. This is a refereed to as SUPER-CRITICAL and is analogous to the period of birth ranging to about the age of 20 in the body. Fermentation is a good way of visualizing this. Now, if we realize that all our lives we are absorbing heavy water from various sources in the proportion of 1 drop of heavy water for every 6000 drops of ordinary water, we see that such an accumulation would cause definite negative effects in the body. The natural process for optimizing the human body and sustaining it in the BEST POSSIBLE PATTERN is through the use of natural CARBON. This system works quite well to keep us from blowing up from nuclear reactions gone super-critical up to the age of about 20. However, we must also remember that all these years we have also been taking in HEAVY WATER. ——————————————————————– Now, since we optimize at 20 and theoretically should stay at that body pattern for ETERNITY as KEPT IN CONTROL by the LEVEL OF CARBON in our system, we now come to the realization that we CONTINUE TO ABSORB HEAVY WATER THROUGHOUT OUR LIVES, though not all of it is RETAINED! Since the carbon has protected us to the age of 20 and continues to protect us, we also have the ADDITIONAL ASSURANCE of death through the absorption of Heavy Water. Remember the Indian accounts of what seem to be atomic wars. Perhaps this increased the natural abundance of D20 so that the LIFESPAN REALLY DID DECREASE from thousands of years to the hundreds of Biblical times. Historical accounts and modern experiments in atomic science add to this line of thought. ——————————————————————– It would seem that we do have one thing going for us. That is the continual EXCHANGE OF COMPONENTS which comprise the body as discovered by Dr. Harold S. Burr. If we rely on that, we still die, since further investigation shows that there are some peculiar properties of Heavy Water which tend to cause ACCUMULATIONS IN THE FAT DEPOTS OF THE BODY which by a large part, ARE NOT SUBJECT TO THE EXCHANGE OF TISSUE. Deuterium administered as a stable isotope reveals some disturbing properties of this nasty little substance. Fats containing Deuterium were fed to mice over a period of several days. They were then killed and examined. Fats from different parts of the body were extracted, burned and analyzed for the PRESENCE OF HEAVY WATER. The BULK OF DEUTERIUM had found its way INTO THE FAT DEPOTS with only SMALL AMOUNTS IN OTHER TISSUES. If rats which have been fed deuterated fats are allowed to starve for several days before being killed, it is found that the fat content of the liver is greater than at the beginning of the starvation. The liver fat is also found to contain TWO TO THREE TIMES AS MUCH DEUTERIUM as that in the fat depots. This indicates that fat is FIRST STORED IN THE FAT DEPOTS. As long as the organism maintains a sufficient diet, THE FAT DEPOTS ARE NOT AFFECTED. However, when starvation conditions are present, THE FAT DEPOTS ARE DRAWN UPON BY THE LIVER. The use of isotopes in the study of metabolism has conclusively proven that the body is in a highly dynamic state which provides for a CONTINUAL INTERCHANGE between the fats, proteins and carbohydrates already in the body and ingested in the form of food. The electrodynamic research of Dr. Burr in the 40’s and 50’s had shown that all protein is completely replaced at least once every six months. Further biological research involving Deuterium as a trace isotope showed that the ingestion of food containing deutero-fats yielded only a small proportion of the ingested deuterium EXCRETED OVER A PERIOD OF SEVERAL DAYS. The major part of deuterium was found to have been DEPOSITED IN THE FATTY PORTIONS OF THE BODY as stated above. The interesting observation was that even when the diet was very deficient in fat, with a total caloric intake less than adequate for health, and the animal was forced to draw upon its fat reserves, the deutero-fat CONTINUED TO BE STORED and NOT PUT TO IMMEDIATE USE. When a natural diet for the animals was resumed, the labeled fats (deutero-fats) were FOUND TO DISAPPEAR GRADUALLY, the deuterium leaving the body in the form of water. Now, taking into consideration the fact that we rarely change our diet or location for extended periods (i.e. 6 months or more), DOES IT NOT FOLLOW THAT THE INGESTION OF DEUTERIUM IN ONE’S DIET WOULD REMAIN RELATIVELY CONSTANT? Yes, reversibility is possible in a living organism, however, the very nature of our environment precludes any guarantee of success by simply drinking distilled water. Remember that 2/3’s of all water intake is THROUGH THE SKIN! An additional point that we need to stress is the fact that the body is based on CARBON which reaches a relative maximum accumulation based on physical size (between 18 and 22 years of age). In addition, neutron collisions with CARBON require 114 collisions while Deuterium continues to accumulate throughout your life and requires only about 20 collisions TO REDUCE THE THERMAL VALUE. Therefore, the elastic scattering of Deuterium is much more efficient than Carbon resulting in a more rapid and complete reduction of energy throughout the system. This energy takes the form of heat and electrical energy in the form of ions. We can easily associate YOUTH with FERMENTATION, HEAT, and AN ABUNDANCE OF ENERGY. While OLD AGE is associated with PUTREFACTION, COLD and a GRADUAL REDUCTION OF ENERGY with DEATH as a result. So, again we see the energy and health associated with youth being controlled by the mass aggregation of Carbon for a SUPER-CRITICAL state resulting in physical growth. When the body reaches a maximum physical size, the Carbon continues to thermalize the biological fission processes to maintain a healthy and energetic existence. However, with the continued assimilation and accumulation of heavy water in the tissues, the fission processes are thermalized (slowed down) beyond a level to generate sufficient energy and heat for the optimum maintenance of the life process in a youthful condition. Of course, this affects people in different ways depending on their natural size, physical condition, the ACCUMULATION OF HEAVY WATER MAINTAINED IN THEIR SYSTEM and the accumulation of D20 based on the amount of heavy water IN THEIR ENVIRONMENT. Some other interesting findings while researching this phenomenon is a mention that NOT ALL CELLS ARE ABLE TO UNDERGO MITOSIS (cellular division)! It has been found that ONLY ABOUT 3 PER CENT of the cells in the ADULT human body are capable of dividing FOR THE PURPOSE OF TISSUE REPAIR. This is another indicator that the overall energy level is less that what it COULD BE if the heavy water thermalizer could be SUPPRESSED OR CONVERTED to the innocuous form of ordinary water. Malignant (cancerous) cells are characterized by the ABNORMALLY HIGH RATES AT WHICH THEY INCREASE IN NUMBER! The increase is due to the much larger proportion of the cells that ARE CAPABLE OF MITOSIS. In normal tissue, about half the cells formed are able to divide which keeps the total number of cells almost constant. In some cancerous tissue, nearly every cell can divide further and so the cell population increases more and more rapidly with time, MUCH LIKE THE SUPER-CRITICAL STATE. This indicates that we should not attempt to attain or keep the body in a SUPER-CRITICAL (fermenting) condition since MUTATIONS will be a probable resultant. This is an indicator that living organisms can be forced to continue growing beyond a natural size but with mutation as an everpresent danger. ——————————————————————– In Alchemy, there are many stories of the Elixir of Life. One such taken from the Comte de Gabalis speaks of a rejuvenation which took place in the 17th century. The story loosely told says that the Count de Gabalis was a noted Alchemist said to be able to manufacture precious gems, transmute lead to gold and to know how to make the Elixir of Life. Rumors of the time said the Count was in excess of 400 years of age, although he appeared to be in his early thirties. Being such an interesting and wealthy personage, the Count was frequently invited to Court and the various social occasions throughout Paris. An elderly lady in her 70’s became quite a friend of the Count and begged him to sell her a sample of the Elixir of Life. The Count said that money was not something which he needed since he could make all he wanted. However, he did take a fancy to the lady and gave her a small vial of a clear liquid. He instructed the lady to take the full vial before going to bed. When she awoke, she would be a young girl once more. Well, the lady being somewhat forgetful, set the vial on her dressing table that night. On arising the next day, she proceeded to make ready for the social rounds of the day. The lady had an elderly maid who had been with her for many years. While the mistress was attending a social function, the maid began cleaning up the mistress’s quarters. Feeling a headache come on, she looked on the dressing table for a powder or medicine which might alleviate the headache. On finding the vial, she assumed it to be a medicine and drank it. When the elderly lady returned late that night, she found a young woman cleaning her quarters. The lady insisted that the intruder leave, at which the young woman asked if Madam did not recognize her trusted and long-time servant. On hearing this, questions were asked which proved the young girl to indeed be her servant, though much younger. At this, the old lady remembered the Elixir and asked if the girl had touched anything on the dressing table. Of course, the young girl explained what she had done. On looking in the mirror, she was astounded to see the truth of the Elixir. The entire city was abuzz over the case for years to come since the proof was evident. The Count left shortly after and was never heard from again. The interesting part of the story is that the maid went through a COMPLETE REJUVENATION in a period of about 10 hours. Also, the rejuvenation only took the lady back to approximately 20 years of age. THIS AGAIN FITS WITH THE CARBON CONTROL OF THE FISSION PROCESS TO ACHIEVE A CRITICAL MASS STATE! ——————————————————————– Interesting reports have also been found relating to the results of fasting on living organisms. In the 1930’s at the Zoology Department of the University of Chicago, experiments showed that worms, when well-fed, GREW OLD, but by fasting they WERE MADE YOUNG AGAIN. In one experiment worms were fed as much as they usually eat, except one worm, which was isolated and alternately fed and fasted. The isolated worm was alive and energetic after 19 generations of its relatives had lived out their normal lifespans. The lifespan extension of these worms WAS THE EQUIVALENT OF KEEPING A MAN ALIVE FOR 600 TO 700 YEARS! ——————————————————————– This startling report shows that fasting for prolonged periods will actually consume the fat depots WHICH CONTAIN THE D20 DEPOSITS, thereby restoring the metabolic energy level to its full potency by allowing the Carbon of the body to do its job without interference from the D20 accumulations. This is obviously the NEXT BEST THING to having an Elixir of Life. We have only one more point to make which might further elucidate the subject of biological transmutation. That point is taken from the work of Dr. George Crile, years before Kervran’s famous study of Biological Transmutations. ——————————————————————– Dr. Crile carried out research into the Bi-Polar phenomena of Life, specifically involving the production of electrical currents in protoplasm by oxidation and radiant energy. He came to believe that the living organism is specifically adapted to the formation, storage and specific use of electric energy and that the genesis of electric energy is due to RADIANT ENERGY emitted (by ultra- microscopic units or FURNACES in protoplasm. These furnaces he called RADIOGENS. 1) Short wave radiation knocks off electrons and thus disturbs the electrical state of the protoplasm, especially of the infinitely intricate network of the nervous system. 2) Short wave radiation so DISTURBS THE ARCHITECTURE OF THE ATOM as to make atoms CHEMICALLY ACTIVE, thereby forming the basis for the SYNTHESIS OF PROTOPLASM. RADIOGEN is the descriptive term which Crile adopted to denote the theoretical units of protoplasm in which oxidation occurs and from WHICH RADIATION IS EMITTED. He believed that LITTLE OR NO OXIDATION tooks place in the great mass of protoplasm outside of these infinitesimal units or RADIOGENS. The RADIOGEN unit is patterned after the Solar System or the atom; that the nucleus or sun of this infinitely small solar system is an atom of IRON; that these atoms of iron, bearing a sign of like charge, REPEL EACH OTHER as do metals in colloidal suspension, and that by this radiogen, ENERGY IS CONTINUOUSLY RELEASED AND ORGANIC COMPOUNDS ARE CONTINUOUSLY BUILT UP. The element iron, in the position of a miniature sun, would be in continuous oscillation thus producing a temperature of not less than 5,000 degrees Centigrade, just as the element iron in the sun is in continuous oscillation. The degree of this temperature is indicated by the genesis of Ultraviolet, visible and infra-red radiation; in other words, a RE- RADIATION OF THE SOLAR ENERGY originally put into the organic molecule in the plant takes place in the radiogen. Enzymes are organic compounds able to accelerate in a pronounced manner a number of chemical reactions. Enzymes are credited with having NO ENERGY, but nevertheless with CONTRIBUTING VAST AMOUNTS OF ENERGY. Enzyme activity increases in the springtime or as a result of stimulation, or from a rise in temperature. “The Phenomena of LIfe” published in 1936 by Norton & Company. Try Health Research as they probably have a reprint. We have been studying the work of Dr. Crile and Dr. Burr for years and recommend them highly. Vangard Sciences has made a project of collecting any medical/electronic books, such as these, prior to about 1955. A word of warning to any who might wish to pursue this subject, (as we are currently doing), SPONTANEOUS COMBUSTION as mentioned throughout this paper is the PRIMARY HAZARD when working with such atomic processes. If you dabble with a fluid, do it first on an old animal and IN VERY SMALL PORTIONS. If you use electromagnetic impulses, use the LOWEST POSSIBLE AMPLITUDES. We believe that Homeopathy or Radionic techniques might prove quite efficacious for this application since they work with such small energy levels. Speculation on the nature of the fluid termed “the Elixir of Life” indicates that it might originate IN A NATURAL FORM, but can also be SYNTHESIZED. There are of course, other methods of approaching the problem as listed above. Again, we MUST WARN YOU that experimentation in this area CAN BE LETHAL! If the process of D20 to H20 conversion is abrupt and anywhere near total, rather than an atomic explosion, we would see a COMPLETE CONSUMPTION of the body by INTERNALLY RELEASED HEAT AND RADIATION. Remember, the iron suns of Dr. Crile’s Radiogens are estimated to burn at 5000 degrees Centigrade. If these little boogers are for real, then a Super-Nova on a Microcosmic level might be possible. The inverse square law causes this temperature to be greatly reduced but still WELL WITHIN THE COMBUSTION LIMITS OF BODY AND FAT! The emission of a host of various radiations by the Radiogen will result in the generation of heat, electricity, ionizing radiation in the Ultra-Violet range as well as visible and infra-red frequencies. During the 30’s and 40′, many of the young women who painted watchfaces with Radium for the glow-in-the-dark effect, used to point the paintbrush tips with their tongues. This radiation buildup caused tragic and lethal effects according to various medical journals of the time stating that although the women were in their early 20’s, they had aged to a physical appearance ranging from 60 to 90 years of age. Premature death was the inevitable result. Remember the earlier warning that D20 (heavy water) ingested by living systems resulted in ABNORMAL METABOLIC RATES. These rates can range from slower to faster which could either retard or accelerate the combination of physical effects known as AGING. This work is ongoing and done without benefit of outside funding though we welcome suitable opportunities. Think what we could do if this was FULLTIME and SPONSORED??? Since the publication of the original paper, we have found some other interesting and related information..
Mr. Hans Nintzel allowed us access to a very rare alchemical document relating to the manufacture of a substance known as Oil of Antimony. This oil is claimed to be a means for rejuvenation. One of the practices of Alchemy is the removal of the oil or “essence” from various substances. The end result of this process is referred to as a “tincture”. Anytime you make tea or coffee, the act of boiling the coffee beans or tea leaves, removes the oil to flavor the fluid. Hans has written an excellent paper on the subject of alchemy, which he has graciously shared with KeelyNet (under the name ALCHEMY1). All things can be subjected to this process (including metals), not necessarily relying exclusively on boiling, for the purpose of removing the oil. The oil, being the essence of the material, has greatly magnified effects and specific effects as detailed in the alchemical literature. Antimony is normally extremely toxic to living organisms, however, if the Oil is properly removed and consumed, it is alleged to cause a complete rejuvenation. The rejuvenation story, again loosely told, says that when this Oil of Antimony is taken internally, it causes ALL DEAD OR DYING TISSUES to be EXPELLED from the body. Hair, teeth, fingernails, toenails, dead surface skin and dead tissue from within the body either fall off or exit to the surface of the skin. The process takes upwards of 3 days. Perhaps this is a means of removing the D20….who cares as long as the body can be rejuvenated. As the body undergoes this process, it reverses age back to approximately the age of 20. Can you imagine anyone undergoing such a process? What would one look like with no hair, teeth, nails and crud oozing from the skin? I think most people would simply disappear for a few months until the process was complete and their hair, nails and teeth were restored. Would it not be worth it to regain a youthful 20 and be allowed to start all over again with a new body? You most likely would not lose your memories or other knowledge. After many conversations with various associates, they all seem to concur that the most effective and safe method of removing the Heavy Water from the system would NOT involve any transmutative process. This would prevent the necessary neutron emissiom as deuterium was “downsized” to that of hydrogen. When neutrons pass through the body, they can cause DNA/RNA damage. Such damage results in mutations leading to physical deformities and/or cancer. Note that physical deformities most easily occur in the younger years of the organisms as the body is establishing its form and in the growing stages. Cancer can occur at ANY TIME during the life of the organism so is therefore the easiest and most common of the effects of DNA/RNA damage. Therefore, all our associates consulted on the matter agreed that REMOVAL of the D20 from the deep fat depots would be the most desirable of the methods. Some form of chelating agent (a substance which would target and latch on to the D20) that could then be flushed from the system would be preferred. This of course should be done in stages, since we would not want a sudden rise in the electrical energies of the body for fear of inducing spontaneous combustion and literally flaming up. One of our associates, Bill Strauss of California suggested the use of a homeopathic reagent derived from a radionic query process. We sent him the atomic frequency of Deuterium, taken from standard NMR charts which he then had made up into a 2 dimensional geometric pattern designed to reverse the deuterium frequency by 180 degrees. The idea was to place a glass of water or other beverage on the pattern with the intent of cancelling out the deuterium. Another method of using it was to wear it in proximity to the body with the intent that it would gradually reverse existing D20. Bill made up several dilutions of water homeopathically treated of which I took the X10 dilution for a period of 3 weeks. I did note a reduction in the sleep I required, more energy and a slight upset in my digestive processes. However, I can not count this as authentic since I know what is expected. Extract: Deuterium contents of river waters were measured monthly from August 1974 to July 1975 at the head of the Imja Khola (river). Although seasonal change is slight, momentary deuterium enrichment takes place in the begining of monsoon caused by the extraordinary deuterium-rich precipitations. In the postmonsoon and winter seasons the change is at the least, and deuterium content in these periods may represent mean value for the regional glacial melt waters. Deuterium contents of six rivers in the Sun Kosi drainage were measured, and they gave a large difference in the deuterium content. In a quite short distance about 100 km from east to west, remarkably large difference from -66.0% to -125.8% was observed. This large difference is interpreted by the various climatic conditions and complicated topography in the Himalayas. Less Deuterium ; That is why they live longer! These mice pictured above are all 14 months old.As young adults, nine mice were given sub-lethal doses of radiation and nine others were left as untreated controls. The control mice (left) are still sleek and vigorous at 14 months, while six of the irradiated mice have died and the remaining three show signs of extreme aging. In each case, cells growing in tissue culture were irradiated with ultraviolet light and then the efficiency with which they repaired their DNA was determined. From the work of R. W. Hart and R. B. Setlow, 1974. At the end of life DNA has been compromised.No method short of reordering all DNA will significantly extend life. – Deuterium has an effect on biological processes throughthe mechanism of hydrogen bonding. – Hydrogen bonds major play a role in DNA structure and are responsible for the double DNA strand assuming a helical shape. – The bonds created by a deuterium atom are stronger than for a normal hydrogen atom. Dashed lines are hydrogen bonds. The greatest effect occurs when a deuterium atom directly participates in a hydrogen bond.Values shown are in kcal/mol. Exchange of some hydrogen atoms have little effect such as those under Min H-Bond D-Exch.Others have a large effect such as those under Crit H-Bond D-Exch. The maximum effect occurs when all hydrogen atoms are exchanged. 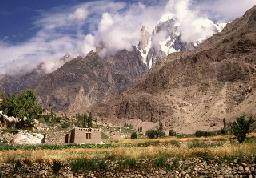 – Based upon geography and altitude we can infer that the deuterium content of the Hunza region is at or below 133 ppm. – True age of Hunza people is difficult to verify, but there is ample evidence to support the claim that the elderly people of the region are vigorous and long lived. – Growing food with DDW is key because not all organic compounds will exchange deuterium for hydrogen quickly. @ -OH Group bonds to Carbon, Nitrogen, and Oxygen depending upon pH. @ Hydrophobic molecules will not undergo H/D Exchange. – DDW does not change its chemical composition when digested and has a direct effect at the cellular level. – Consumption of DDW can conceivably protect DNA from damage and assist DNA repair mechanisms, but it does not directly repair DNA. – DDW consumption will not rejuvenate the body, but it may help to protect the body and enable it to function more efficiently. Russian Institute for Biological Medicine launched production of light water, differing from ordinary water by stimulating all human systems’ activities through data-flow level. Institute’s vice-president claims such developments are unique and cannot be found anywhere else in the world. Natural light water is found in mountain rivers and melting glaciers. Scientists designed rectifying columns for water fractional distillation and derived water free from its heavy components. Light water normalizes any pathology found in an organism. It also improves body resistance to harmful effects of physical, chemical and biological origin. Clinical trials revealed light water’s ability to dissolve higher concentrations of various substances and to penetrate membranes easier than ordinary water. Light water showed anti-inflammatory effect and eliminated tissue puffiness. Recently developed “Langway” water is already available at the US market. Tests proved its potential to refine cell metabolic processes through accumulating energy inside a cell. Light water is highly recommended for skin regeneration stimulation. “Langway” tones the skin, reduces its greasiness, narrows skin pores, slows ageing and helps skin to resist negative environmental impact. Light water also regulates excretion of toxins, salts of heavy metals, cellular debris and infectious germs. Another positive aspect is that such water lowers blood sugar and cholesterol, thus it can be recommended for patients, suffering from diabetes, atherosclerosis, obesity and hypertension. Russian scientists developed and began to produce live water  light water that removes harmful substances from body and produces rejuvenating effect.  Langway-IBMED-50 purifies and removes toxic products from body, salts of heavy metals and other harmful substances, – informed Interfax Chief Medical Doctor – Director of the Institute of Biological Medicine (IBMED), Academician Y. Bloshansky. According to him, natural water is one of the factors of our bodys imperceptible poisoning. It contains heavy isotopes of hydrogen (deuterium) and oxygen in quantities that considerably slow energy processes in cells, harm bodys vitality and damage genic apparatus. It is caused by its dissociation with terrestrial organisms due to space origin. Light water that has been purified of heavy isotopes acts on all body cells and results in a healthy glow and skin, said Y. Bloshansky. The academician is sure that usage of light water with low contents of deuterium can prolong life of every organism both unicellular and multicellular one. For the first time mountain freshness for your skin! Unique properties of light cosmetic water “Langway-IBMED”  keep your youth!Unique properties of light cosmetic water “Langway-IBMED” keep your youth! Clinical Tests: Clinical tests showed that light cosmetic water “Langway-IBMED” intensifies epithelization, increases skin moisture, has anti-inflammatory action, removes edemas.Clinical tests showed that light cosmetic water “Langway-IBMED” intensifies epithelization, increases skin moisture, has anti-inflammatory action, removes edemas. Light cosmetic water “Langway-IBMED” tones up, cleanses skin and increases the effect of cosmetic products.Light cosmetic water “Langway-IBMED” tones up, cleanses skin and increases the effect of cosmetic products. Solubility of different substances in light water is higher than in traditional water.Solubility of different substances in light water is higher than in traditional water. Light water “Langway-IBMED” has lower viscosity than usual water that allows it to penetrate through cellular membranes.Light water “Langway-IBMED” has lower viscosity than usual water that allows it to penetrate through cellular membranes. Application of these properties can significantly increase effectiveness of active components of the “Celletelle” cosmetic products in complex face skin care by application of different creams in combination with light water.Application of these properties can significantly increase effectiveness of active components of the “Celletelle” cosmetic products in complex face skin care by application of different creams in combination with light water. Clinical tests in Cosmetology Clinic “Institute of Beauty” (Moscow) showed high effectiveness of light water.Clinical tests in Cosmetology Clinic Institute of Beauty “(Moscow) showed high effectiveness of light water. Additionally, for complex body rejuvenation it is recommended to drink superlight biologicaly active medicinal water “Langway-IBMED-50”. Additionally, for complex body rejuvenation it is recommended to drink superlight biologicaly active medicinal water “Langway-IBMED-50.” Medicinal water Langway-IBMED-50 has a wide spectrum of biological activity, in particular: increases immunity, has detoxifying action, stimulates regeneration of cells and tissues.Medicinal water “Langway-IBMED-50” has a wide spectrum of biological activity, in particular : increases immunity, has detoxifying action, stimulates regeneration of cells and tissues. # Restores youth and longevity! – increases body energy resources increases and immunity, prevents inflammation, in particular on skin surface  pustules, acne, eczema, etc. Clinical Tests: Tests of light water (in vitro) at the A. P.P. Hertsen Moscow Scientific Research Oncological Institute and the Scientific-Research Institute of Carcerogenesis of N. Blochin and the Russian Oncological Scientific Centre in cooperation with State Scientific Centre of the Russian Federation “Institute of medical-biological problems “confirmed inhibiting action of light on water multiplication of tumorous cells and growth of tumors. Clinical tests in N.N.Clinical tests in N. Blochin Scientific Centre showed that application of light water in complex treatment of patients suffering from breast cancer removes consequences of toxics (vomiting, pain, hair shedding) caused by chemotherapy. Tests carried out in laboratories of Scientific Centre of Children Health of the Russian Academy of Medical Sciences showed that application of light water significantly increases ( by 30%) energy resources in cells as well as level of cells protection from penetration of different toxins. The effect of light drinking water on patients with different metabolic disorders (arterial hypertension, obesity, carbohalrate metabolism disorders, dislipidemia, diabetes 1 and 2) was examined by the Endocrinology Department of the Russian Scientific Centre of Renewing Medicine and Balneology of the Ministry of Health of the Russian Federation. After the course of application of light water, patients with increased level of beta  lipoproteins and coefficient of atherogeneity showed marked reduction of indices. In this group beta  lipoproteins index reduced by 52% and coefficient of atherogeneity  by 113%. In the control group reduction of indices made 43% and 35%. Results of tests confirm that light water has effective hypoglycemic, hypolipidemic and hypotensive action on the body of patients with different metabolic disorders, it improves metabolism processes and increases body immunity. On the basis of results of these tests light drinking water is recommended by Russian Scientific Centre of Renewing Medicine Balneology and of the Ministry of Health of the Russian Federation in complex treatment of diabetes 2 and different metabolic disorders as well as in program of weight correction. Application: Daily dose-1 liter. First glass of water on empty stomach in the morning. Optimal course-from two months of application. It is not recommended to apply superlight biologicaly active medicinal water “Langway-IBMED-50” later than 2 hours before sleep since it has expressed tonic action. Constant application of medicinal water can significantly prolong life of any body. For convenience of application in cosmetology light water is produced as aerosol. Due to its unique structure and properties this water stimulates skin regeneration, reduces inflammations, slows skin ageing and has rejuvenating and moistening action. Certificate of registration of the Ministry of Health of the Russian Federation N 77.99.15.6.U.918.2.05. dated 03.02.2005.dated February 3, 2005. Abstract — A method for the preparation of biologically active healing water at a low content of heavy hydrogen isotopes involves operations of preliminary purification of original water from hazardous and poisonous substances, water cooling and subsequent removing heavy hydrogen isotopes – deuterium and radioactive tritium from water in the water flow by an optionally solid condensation of these heavy isotopes in two stages. Upon obtaining the required icethickness the crystallization process is stopped and simultaneously heavy oxygen isotopes Ä17 and Ä18 is removed. Thereafter the light water with a low content of heavy hydrogen and oxygen isotopes is collected, thawing and pouring of condensate is performed, obtained water is activated by an optimization of mineral composition and structure thereof. Before removal of heavy hydrogen isotopes from water the original water is overcooled to the temperature of -0.5…-10c with an intensive agitation thereof. A plant for realizing the method contains a unit of preliminary cooling the original water, condensation apparatus, apparatus of overcooling below 0 0c and intensive agitation of the original water. The condensation apparatus is made in the form of closed vertical disposed hollow water conduit of -like form, which has heat-exchangers installed, which are connected to the refrigerating fluid and heat carrier sources, and straight flow pump with flow regulator. The upper branch of the water conduit is connected to the unit of preliminary cooling original water and to the apparatus of preliminary purification and decontamination of water, and the lower one is connected to the apparatus for optimization of mineral composition and structure of water. The heat exchangers are made in the form of tubular multi-row spiral having space between the coils filled with heat-conducting material and noble minerals. The apparatus of overcooling and intensive agitation of the original water contains processing chamber of cylindrical form with conical bottom and cover. The system of water condensation is disposed under cover, and above the cover the apparatus for reciprocal rotation of heavy water isotopes is disposed which is made in the form of tubular multi-row spiral. Abstract — FIELD: food processing industry. ^ SUBSTANCE: drinking water with increased content of represents industrially obtained light water containing at least 997.13 g/kg (or at least 997.36 g/kg, or at least 997.51 g/kg) based on total water amount, wherein sum amount of 1H2D16O, 1H1D17O, 1H1D18O, and is at most 2.87 g/kg (or at most 2.64 g/kg, or at most 2.49 g/kg) based on total water amount. Drinking water with increased content of is useful in production of dairy, confectionary, bakery, fat-and-oil products, souses, fish and meat products, pasta, chewing gum, soy products, vinegar, vodka, brandy, tincture, balsam, liquor, alcohol cocktail, soft drink, mineralized water, functional products animal feed supplement. ^ EFFECT: water for optimization of isotopic composition in human body, foodstuffs and beverages of high technological characteristics. Abstract — The invention relates to a gerontological and antitumoral method of treatment, by means of deuterium depleted water, which consists in administering light water, respectively superlight SU1 and SU2 RDW-type, having a deuterium content of 120 ppm D2O, as beverage or concentrated beverage, in two successive 30- day stages, separated from each other by a period of 90 … 180 days. Abstract — Treatment involves prescription to patient light water as drinking water with the total mineralization 200-500 mg/l, the deuterium content 100 ppm, not above, and the oxygen-18 content 1800 ppm, not above, on the background of dietetic therapy and insulin therapy or intake of hypoglycemic preparations in the daily dose 1000-1500 ml. The first intake is carried out before eating in the morning in the dose 200-250 ml and the remaining amount for a day, 30-40 min before eating or in breaks of eating every day. The curative course is from 28 to 45 days. Method provides declining the blood glucose content and to improve metabolic processes. ^ EFFECT: improved treatment method. Abstract — Individual’s skin, hair, nails, mouth cavity care means for improving state and appearance thereof is selected from the group consisting of perfume means, cosmetic means, hygienic means containing light cleared water in the form of component or base, with content of 1H2 16O in light cleared water making at least 997.13 g/kg of total amount of H2O, and acceptable perfume components and/or base, and/or cosmetic components, and/or base, and/or hygienic components, and/or base, and/or active substances. Utilization of light water with increased content of 1H2 16O as best solvent and/or diluent, and/or carrier of other active components in receipt of said means is more effective in comparison with similar means prepared with the use of water with standard content of 1H2 16O. ^ EFFECT: increased efficiency in utilization of said means for improving state and appearance of individual’s skin, hair, nails and mouth cavity. Abstract — PROBLEM TO BE SOLVED: To provide a method for maintaining health by solving the following problem: usually retort foods such as rice gruel, cream, curry and the like are produced by using water, but they are impossible to more surely maintain human health by taking the same. SOLUTION: The retort pack foods such as rice gruel, cream, curry and the like are produced by using deuterium-depleted water (super light water). By taking the retort foods, one’s health is possible to be maintained. Abstract — PROBLEM TO BE SOLVED: To provide a method for treating and preventing the following diseases and performing the rejuvenation, activation of cells and promotion of the increase of immune cells by solving problems such that, conventionary, the treatments of cancer, diabetes mellitus, leukemia, aplastic anemia and insomnia are usually coped with surgery, radiation treatments, medicinal treatments, and the like, and in these cases, patients visit directly to hospitals or clinics and receive treatments, but in the case of SARS, there is no treating method found. SOLUTION: This soy sauce produced by using deutrium attrited water (super light water) as the raw material can be used for the treatment and prevention of the cancer, diabetes mellitus, aplastic anemia, insomnia and SARS, rejuvenation, the activation of the cells and promotion of increase of the immune cells. Abstract — An system for separating tritiated water from common water, using gravity and the freezing point of tritiated water to cause tritiated water to freeze along the inside of a conically-shaped collection chamber. The common water and liquid tritiated water that pass out the bottom of the conically-shaped collection chamber are pumped back to the top of the conically-shaped collection chamber for repeated runs until sufficient tritiated water has frozen to the inside of the conically-shaped collection chamber. A water wheel is positioned to assist in powering the pump that drives water through repeated runs. Abstract — An apparatus and method for separating heavy isotopes of hydrogen from contaminated water. The apparatus includes a treatment chamber with an elongated hollow core fiber (HCF) extending within the chamber. A reservoir holds contaminated water mixed with beads formed of an exchange resin, the mixture of contaminated water and beads forming a flowable slurry. The slurry is continuously circulated through the hollow core fiber and the reservoir preferably by a pulsating peristaltic pump. The beads absorb a portion of the heavy isotopes from the slurry by exchange with waters of hydration of the beads while the hollow core fiber allows permeation of only light water from said slurry outwardly through the HCF wall as a permeate. WATER (H2O) is the third most common molecule in the Universe (after H2 and CO), the most abundant substance on earth and the only naturally occurring inorganic liquid, a billion cubic kilometers of which reside in our oceans and 50 tons of which pass through our bodies in our lifetimes. It has been very well studied with a number of model structures having been proposed and refined. Notwithstanding this, extensively hydrogen-bonded liquid water is unique with a number of anomalous properties. It has commonly been stated that no single model is able to explain all of its properties. And we all thought water was the simplest of all things. Evidently not. Let’s have a closer look at it. The first complication with water is that there are three different forms of hydrogen that we know of, each capable of combining with oxygen to produce a clear odourless liquid that on first inspection looks and feels like water. # The first, protium (H), is the one we commonly associate with hydrogen. It has at its core only one proton. # The second, deuterium (D), has one proton and one neutron at its core. In combination with oxygen it becomes D2H, which is known as heavy water. Deuterium occurs in water at about 0.015%. # The third, tritium (T), has one proton and two neutrons at its core. It is radioactive and has a half life of 12.32 years. It combines with oxygen to form tritiated water T2O. The low-energy beta radiation from tritium cannot penetrate human skin, so tritium is only dangerous if inhaled or ingested. The water molecule may vibrate in a number of ways. In the gas state, the vibrations involve combinations of symmetric stretch (v1), asymmetric stretch (v3) and bending (v2) of the covalent bonds. The main stretching band in liquid water is shifted to a lower frequency (v3, 3490 cm-1 and v1, 3280 cm-1) and the bending frequency increased (v2, 1644 cm-1) by hydrogen bonding. It is clear that life on Earth depends on the unusual structure and anomalous nature of liquid water. Organisms consist mostly of liquid water. This water performs many functions and it can never be considered simply as an inert diluent; it transports, lubricates, reacts, stabilizes, signals, structures and partitions. The living world should be thought of as an equal partnership between the biological molecules and water. In spite of much work, many of the properties of water are puzzling. Enlightenment comes from an understanding that water molecules form an infinite hydrogen-bonded network with localized and structured clustering. The middling strength of the connecting hydrogen bonds seems ideally suited to life processes, being easily formed but not too difficult to break. An important concept, often overlooked, is that liquid water is not homogeneous at the nanoscopic level. There is obviously much more to it, but this is what it boils down to. Water is not H-O-H, this is only a way of talking. True, for most purposes the formula holds, but it is only true for the average body of water over a longish period of time. The hydrogen atoms in water are not rigidly fixed to the oxygen atoms and have a tendency to move around and find new oxygen partners. A bit like our modern society perhaps? Even in true H2O molecules there are at least three distinct modes of vibration that have different frequencies. Water has a tendency to form clusters. There are sixty three known anomalities of water. To go into this subject here exceeds the scope of this paper. Suffice it to say we are dealing with a complex substance that has a life of its own and often behaves in ways difficult to forecast. Therefore the dissociation of water with a vibratory stream is not an easy task and should not be undertaken lightly without reasonable safeguards especially as to explosions. Heavy water, containing the recently discovered double-weight hydrogen, kills tadpoles, guppy fish, and worms. Prof. W.W. Swingle of Princeton, using some of the rare heavy water manufactured by Princeton chemists, found that the extraordinary H2O, with 92 percent of its hydrogen atoms consisting of the isotope mass two (deuterium), is lethal to certain fresh water animals. Green frog tadpoles survived only an hour when placed in the heavy water. Tadpoles of the same sort immersed in distilled water that contained only 30 percent heavy water, lived happily and unaffected for 24 hours. Paramecia, one-celled organisms that are favorite biology experimental material, resisted the heavy water successfully for 24 hours.